Daryl Impey has done it, the Mitchelton-Scott rider and South African national champion has won back-to-back Tour Down Unders, the first rider to ever do so. 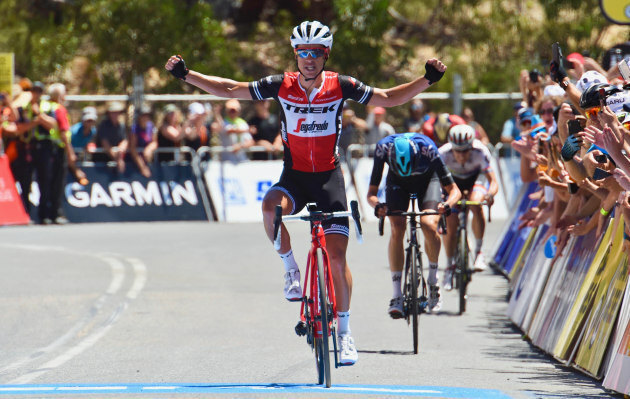 But the day was not all Daryl’s, with ever-popular Aussie Richie Porte winning the final Willunga Hill stage. Not only did the crowds roar for Richie and Daryl, enormous respect was shown for earlier race leader Paddy Bevin who suffered badly after crashing heavily on Stage 5 of the race. Bevin managed to finish Stage 6, much to the delight of the adoring and respectful crowd. Porte, who was in 16th place at the start of the final stage, was propelled to 2nd overall after claiming his 6th Willunga Hill victory. “It’s a hard race for someone like me to win, one hilltop finish and that’s it," Porte said. Richie Porte crossing the line for his 6th Old Willunga Hill win. Image: Sirotti. “But we came here with Trek-Segafredo – my new team – and the boys were absolutely fantastic the whole week,” he added. With Team Sky’s Kenny Ellisonde and Wout Poels putting in a scintillating performance on the first then second ascent of Willunga, Richie said the climb “was probably easier than ever” because of being well positioned. “Kenny Ellisonde did a fantastic ride there for Wout Poels, that was hard to have to take it up myself," Porte said.